Patient has no symptoms (asymptomatic). Disease has very benign course ---only 15 percent develop symptoms over a 10-year period. Expectant treatment (Observation). • Patient has non-specific symptoms, such as dyspepsia, fatty food intolerance or intermittent abdominal pain in the upper right quadrant. Disease has benign course. Surgical vs. non-surgical treatments will be considered. • Patient has biliary pain. Disease has less benign course. Surgical treatment recommended. • Symptomatic patient due to unequivocal inflation and obstruction of gallbladder. Disease has no benign course. Surgical treatment. As a gastroenterologist, Rakesh Gupta, M.D. often receives questions from patients regarding the best treatment for gallstones. The evolution of new techniques, reported breathlessly by the mass media, has led to some confusion and false expectations among patients, Dr. Gupta notes. Recently, Dr. Gupta discussed with HEALTH SCENE current techniques for treating gallstones and clarified what the new techniques have to offer, their limitations and the outlook for the future. 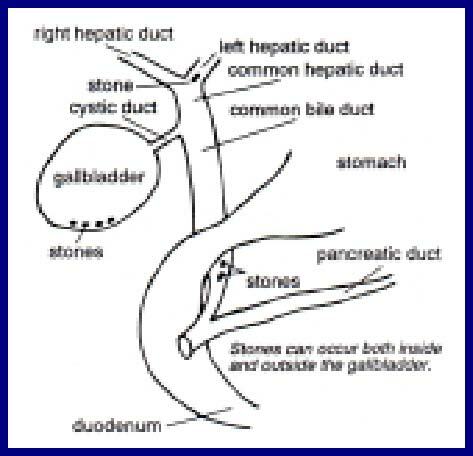 “There are many different types of gallstones---pigment, mixed and cholestorol. Our discussion refers only to the cholestorol type, which is the most common,” Dr. Gupta says. “It is estimated that 10 percent to 20 percent of the adult population in western countries have gallstone-related problems. The incidence is greater in females. By age 70, nearly 25 percent have gallstones,” Dr. Gupta says. Dr. Gupta notes that American Indians and Mexican-Americans, as a group, also have a higher incidence of gallstones. Gallstones form when the liver, which produces bile salts, cannot provide a sufficient supply to keep insoluble cholesterol in soluble form. “To understand how bile salts work, consider the case of butter and water,” Dr. Gupta notes. Deciding on the appropriate treatment depends upon many factors, including the type and severity of the symptoms, and the age and general health of the patient. “The degree of illness varies. My approach to treatment is based upon dividing patients into three categories,” Dr. Gupta says. “If we are certain that the stones are the cause of the patient’s symptoms, removing the gallbladder (cholecystectomy) is the procedure of choice--provided that the candidate is a good risk for surgery,” Dr. Gupta says. “In the third category the patient experiences mild, recurrent pain, such as indigestion or dyspepsia---a vague sense of feeling things are not right with the stomach. Alternative treatment can be considered for this category of patient,” Dr. Gupta says. The two treatments receiving the most coverage by the media recently are: dissolving the stones with medicine containing bile salts, and lithotrispy---which pulverizes the stones with shock waves. However, each treatment has inherent limitations, Dr. Gupta notes (see sidebar at right). “Furthermore, another technique---that of putting a catheter in the gallbladder and dissolving stones with a solution similar to ether---is being investigated and may hold promise for the future,” Dr. Gupta concludes.